The I-TTL Speedlite with the Guide No.GN58 (ISO 100,180mm), Suitable for The KF-882 Speedlite's Features. K&F Concept Wireless Flash Speedlite. ✮Flash mode : TTL, M, FEB, Slave, S1, S2, Multi. ✮Slave Group and Unit : 4 Slave lommunication channels (1,2,3,4) 3 Slave unit group (A,B,C). I-TTL Speedlite,GN58 (ISO 100,180mm) deal with powerful and frequent flash in different sceni. 1X KF-882 Flash Speedlite. Flash mode :TTL, M, FEB, Slave, S1, S2, Multi. Slave Group and Unit : 4 Slave lommunication channels (1,2,3,4) 3 Slave unit group (A,B,C). I-TTL Speedlite,GN58 (ISO 100,180mm) deal with powerful and frequent flash in different sceni. Support wireless Master/Slave function and S1/S2 light flashing mode. Nikon:D3000,D5000,D3100,D5100,D7000,D800,D40,D40X,D50,D60. K&F Concept KF-150 TTL Macro Ring Flash Light Speedlite with 6 Adapter Rings(52/55/58/62/67/77mm) for Nikon. KF-150 Marco Ring Flash Speedlite Specification Marco Ring Flash Speedlite Feature Multiple flash mode: TTL auto flash for convenient operation as normal auto exposure; Master- manual flash for personal needs in exposure; Multi flash mode and rear-curtain sync for shooting a moving object. E-TTL Speedlite,GN58 (ISO 100,180mm) deal with powerful and frequent flash in different scenes. Support wireless Master/Slave function and S1/S2 light flashing mode. The trajectory of the subject can be captured by strobe flash. • Up and down whirl angle degree : 0~90 degree. • Left and right whirl angle degree : 0~180 degree. KF570II Flash Speedlite Feature. 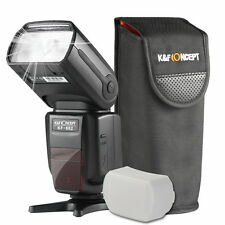 K&F Concept Wireless Flash Speedlite. Compatible with NIKON FM FE FA EM FG F4 F5 F6 N8008 N4004 N50 N70 P6000 P7000 P7100 P7700 P7800 COOLPIX A D90 D3000 D3100 D3200 D3300 D5000 D5100 D5200 D5300 D7000 D7100 D200 D300 D600 D610 D700 D750 D800; CANON AE-1 A-1 F-1 T50 T60 T70 T80 T90 EOS Rebel T2i T3 T3i T4i T5 T5i SL1 20D 30D 40D 50D 60D 70D 7D 5D 5D mark II & III 6D 7D mark II. Trending at $88.32eBay determines this price through a machine learned model of the product's sale prices within the last 90 days. The E-TTL Speedlite with the Guide No.GN58 (ISO 100,180mm), Suitable for: CANON Rebel (T6i T6 T6s T5i T5 T4i T3i T2i T1i XT XTi XSi), CANON EOS (750D 760D 650D 600D 550D 500D 450D 400D 350D 300D 7D 60D),etc. 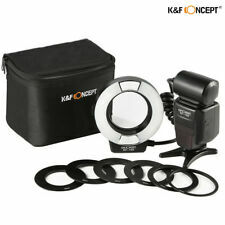 K&F Concept KF-150 TTL Macro Ring Flash Light Speedlite with 6 Adapter Rings(52/55/58/62/67/77mm) for Canon. KF-150 Marco Ring Flash Speedlite Specification Marco Ring Flash Speedlite Feature Multiple flash mode: TTL auto flash for convenient operation as normal auto exposure; Master- manual flash for personal needs in exposure; Multi flash mode and rear-curtain sync for shooting a moving object. The E-TTL Speedlite with the Guide No.GN56 (ISO 100,180mm), Suitable for: CANON Rebel (T6i T6 T6s T5i T5 T4i T3i T2i T1i XT XTi XSi); CANON EOS (750D 760D 650D 600D 550D 500D 450D 400D 350D 300D 7D 60D),etc. 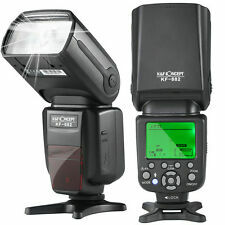 This speedlite can rotate up to 90 degree and down to 7degree. Horizontal rotating "left to right" or "right to left" 180 degree.Rotating the speedlite to the ceiling or wall to make the image more natural. 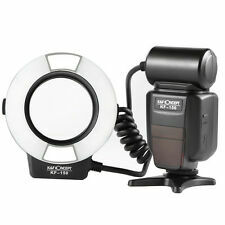 This speedlite is universal for Canon and Nikon DSLR and of which the guide No. is GN58(ISO100 180MM). 1/8000s HSS Support wireless Master/Slave function and S1/S2 light flashing mode,no external triggers are required. ■ Appearance. Appearance is beautiful. It works properly. I send a product by EMS. Item model number: KF22.001. ✮Large LCD screen with backlight mode, easy to master information though in dark. ✮4 pcs AA alkaline cell. The trajectory of the subject can be captured by strobe flash. The Flash tube is mounted in front of your lens producing light that wrap around the objects. 4 adaptor ring is included to enable flashlight to couple with lens. Kit Includes 1 X Macro Ring Lite KF-150 1 X Mini stand 1 X User Manual 4 X Adapter ring (1pc/each size): 52mm, 58mm, 67mm, 77mm. Se incluye 4 anillos adaptadores para permitir que la linterna se empareje con la lente. 4 anillos adaptadores X (1pc / cada tamaño): 52 mm, 58 mm, 67 mm, 77 mm. La pantalla LCD Dot-Matrix con modo de retroiluminación puede lograr un ajuste fácil para una fotografía nocturna nítida. MULTIPLE FLASH MODE: TTL auto flash for convenient operation as normal auto exposure; MASTER- manual flash for personal needs in exposure Compensation; MULTI flash mode and rear-curtain sync for shooting a moving object. 1 X Macro Ring Lite KF-150. Compatible with Nikon DF D5500 D3200 D3100 D3300 D5000 D5100 D5200 D5300 D7000 D7100 D600 D610 D750 D90. Multiple flash mode:TTL auto flash for convenient operation as normal auto exposure;Master- manual flash for personal needs in exposure;Multi flash mode and rear-curtain sync for shooting a moving object.